London Sings! 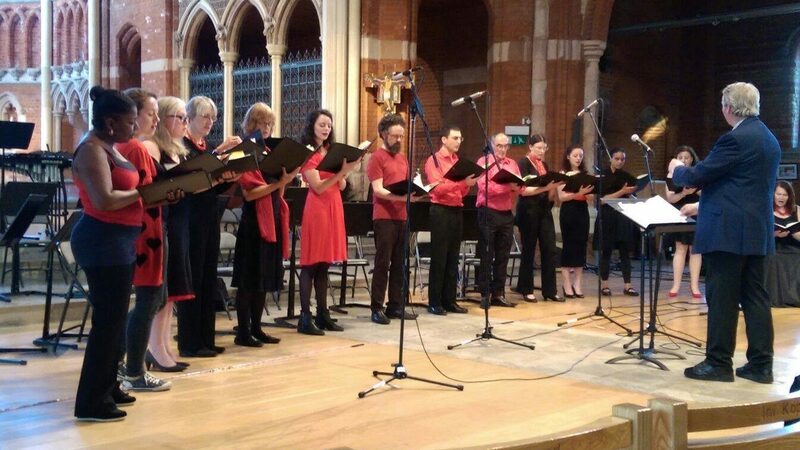 is a new community choir which is part of the umbrella charity South London Community Music. It was founded in 2012 by Bob Bridges and Lesley Khatibi. Bob is the founding Music Director of SLCM and our very experienced and charismatic Conductor and Lesley is a singer who has sung professionally and run several amateur and professional groups. The choir is currently recruiting new members with the aim of growing from its initial small, enthusiastic core of singers to a regular choir of 40-60 singers capable of tackling exciting new repertoire and making an amazing sound. We have made a good start, and our existing members have performed on several occasions, to critical acclaim. We have plans to perform regularly in a variety of venues, both in the UK and from time to time overseas. There is no entry audition and new members of any age or level of experience are welcome to join. We have members who haven’t sung since school, those who have sung in choirs before and professionals. Even if you have only ever sung in the shower, yoSouthu are welcome to come and give us a try. Almost everyone can sing; it’s something we were designed to do and it’s fun. What’s more, it’s good for you! So come and have a good sing with us and leave with a smile on your face. We generally perform 4-part arrangements, covering a wide variety of genres, including jazz, musical theatre, contemporary and classical. As part of SLCM, we also have the opportunity to sing with one of our great bands; Southwark Concert Band or South London Jazz Orchestra. This adds another dimension to our performances and it makes us rather a unique choir. Membership is by subscription and members are encouraged to take part in the administration of the choir by joining our committee. Membership also entitles singers to take part in our performances. We have plans for several performances during 2013 and are currently planning our first international tour. We also like to socialise and in addition to going to the pub after rehearsals, which is an excellent opportunity to get to know your fellow choir members, SLCM ensembles have regular social events, to which all members are invited.